Global Business Intelligence (BI) and analytics software vendor, Yellowfin, has officially launched its industry partnership with The University of Melbourne’s Melbourne Business School (MBS), awarding the inaugural Yellowfin Award for Excellence in Business Intelligence to a group of four students enrolled in MBS’ Master of Business Analytics program. 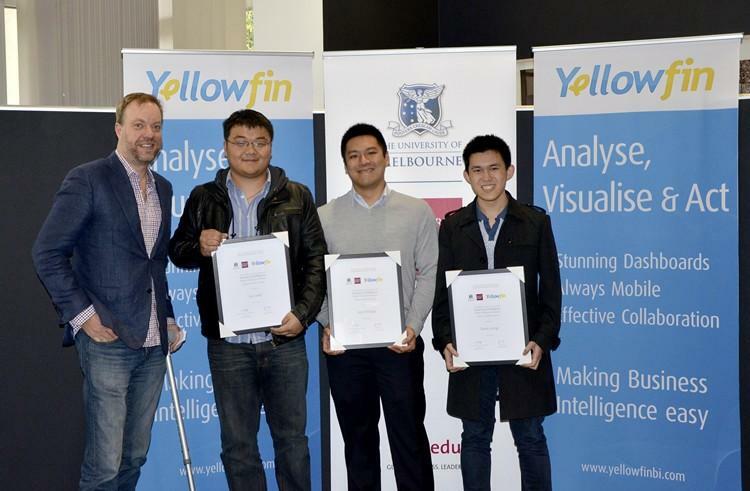 Yellowfin’s BI platform was used as a core piece of software for student learning and assessable coursework throughout MBS’ masters program, with the Melbourne-based BI vendor presenting a $2000 prize to the top-performing student group in the Master of Business Analytics Data Warehousing module (BUSA90500). Using Yellowfin’s BI software, students were required to respond to a brief submitted by Carlton Group Pharmacy, providing a series of analytical sales reports to the management team about key customers as well as most profitable products, store locations and time periods. Yellowfin CEO, Glen Rabie, who presented a guest lecture to students as part of MBS’ Master of Business Analytics program, said that Yellowfin was proud to help support MBS to develop much needed business analytics skills. “Business analytics as an industry is growing very quickly,” said Rabie. “One of the major challenges is to develop better-skilled graduates capable of fulfilling rising market demand for reporting and analytics. The judging panel for the first Yellowfin Award for Excellence in Business Intelligence included MBS faculty and Teresa Pringle, Yellowfin’s Content Services Team Lead, who awarded the prize to the team of Leo Leng, David Loong, Andy McCall and Jason Widjaja. “To be recognized in this way is assurance that we’re on the right track,” said Widjaja. “It’s particularly encouraging because we’ve taken skills learnt in the classroom and applied them to a fair representation of what might be encountered in a real commercial project. Melbourne Business School (MBS) is Australia’s foremost provider of postgraduate management and executive education. Jointly established and led by corporate Australia and The University of Melbourne, with ongoing involvement and support from the business community across all programs, MBS has delivered Australia’s first MBA program since 1963. In 2015, the Master of Business Analytics program was introduced in response to business needs. The Master of Business Analytics program is unique in Australia in that it combines both the technical skills and knowledge required by students to become data scientists as well as the strategic perspective of business.